Darkest Night is a fully-cooperative board game for up to four players, set in a kingdom broken under a Necromancer's shadow. Each player takes on the role of one of the kingdom's last heroes, each with a unique set of special abilities, just as they hatch a plan to save the realm. Searching the kingdom provides new powers and equipment to strengthen you and your party, as well as the keys that can unlock the holy relics and defeat the Necromancer. You can acquire many powerful abilities?unique to each hero?that can help to fight the undead, elude the Necromancer's forces, accelerate your searches for items and artifacts, and more. The knight is a brave and powerful warrior; the prince can rally and inspire the people; the scholar excels at locating and restoring the treasures of the past. But ravenous undead roam the realm, and as the Necromancer continues to build his power base, he blights the land and his army steadily grows. As the game wears on, the Necromancer becomes more and more powerful, creating blights more quickly and effectively. If an area becomes too blighted, it gets overrun?and the monastery receives the spillover. And if the monastery is ever overrun, the Necromancer wins and the kingdom is swallowed in darkness! Before the monastery falls, it's up to you and your party to defeat the Necromancer in one of two ways: If you can gather three holy relics and bring them all back to the monastery, you can perform a powerful ritual to break the Necromancer's power and scour the land of the undead. Alternatively, you can try to defeat the Necromancer in direct combat?but be warned, he will readily sacrifice his minions to save himself. Contents: 30 unique miniatures; one for each hero and one for the Necromancer. 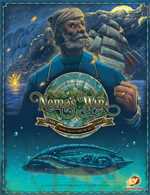 Jules Verne?s classic novel Twenty Thousand Leagues Under the Seas tells the story of Captain Nemo and his astounding ship, the Nautilus. This second edition of Victory Point Games' popular solitaire offering from designer Chris Taylor has been greatly enhanced with mass-production printing and amazing Ian O'Toole art and graphics throughout. Complexity: 3 on a 9 scale. Solitaire Suitability: 9 on a 9 scale. The Nautilus Upgrades Expansion Pack presents 12 new Nautilus Upgrade cards including the Clockwork Cipher, the Adventurer?s League, Nemo?s Manifesto, Prize Crew Quarters, and more! Sail aboard the Nautilus as you have never sailed with her before. Renegade is a cyberpunk deck-building game for 1 to 5 players. The people of Sapporo have been enslaved by a government-run Super-Massive Computer (SMC) known as Mother. You and your team of elite hackers are among the few to have escaped her mental harvest and stand poised to fight back on the digital battlefield.